In depth lure and bait formulation with Kellen Kaatz. 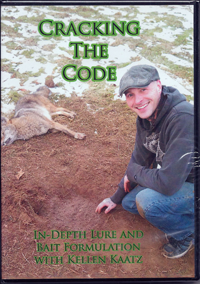 This DVD gets into the nuts and bolts of choosing lure and bait ingredients by answering the question, What else should I add? Get the final word on preservatives, gland preparation, and much more. An in-depth, comprehensive look into troubleshooting and the tricks of the trade from an insiders perspective. 117 minutes. Join Kyle on the basics of collecting, storing, and marketing animal glands. Regardless of fur markets, glands are always in demand, and offer additional income opportunity. Kyle removes glands from rats, beaver, coyote, fox, mink, and otter. Take advantage of these commodities! 40 minutes. Kellen Kaatz shares 17 years of experience in the animal attractant business. This video guide walks you through the basics of preservatives, additives, equipment, and tincturing. Once the basics are established, Kellen shares formulas and the processes of making over 15 different attractants. These insights will give you a foundation for making effective lures and baits for every animal, whether you are a beginner or experienced trapper. Clint Locklear shares tips and tricks, so you can make your own lure and bait. Looks into perfume oils, tinctures, castor and much, much more. This video features an in-depth discussion of the lure and bait making process in detail. The video is approx. 105 minutes long and contains one of the best lure providers ever showing you his methods. Johnny is a 50 year veteran and is a master of his trade.